By Aunt Arctic -- Breaking news! 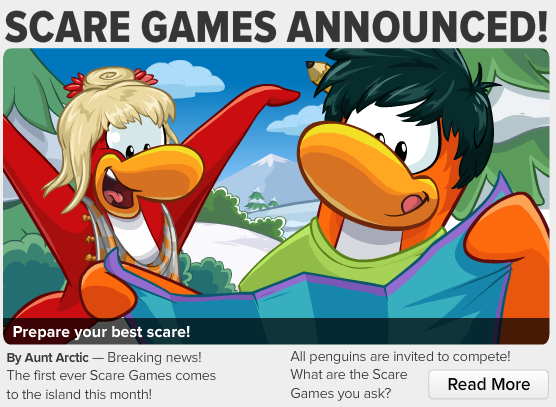 The first ever Scare Games comes to the island this month! Looks like we're going to have to compete in the scare games! I think that's where we win a trophy. By a Ninja -- Fire, Water, and Snow are back in balance! Brave ninjas are journeying through the stormy summit above the dojo to master Snow. It looks like we beat all of the snow minions but we must expect Tusk again soon because Sensei says he is still a threat. Underwater Adventure - Don't forget your snorkel! Get washed away with this month's productuon at the stage! Penguin Style - Fabulous fashions for the fiercely free spirit! Now at the Clothes Shop. Postcards - Make new friends! Send a postcard today!